Data and Content does come from somewhere. In addition, someday someone chose the content to be shown in an interface or on a website. The first impulse to this someone, especially within engineers is to show every data available and even beyond. Because data means value. Because why should you hide it from the user. Because you can. Hence, content is screwed up to a jungle of attention-seeking numbers and graphs. Good designs focus on core values, on key indicators. It sounds easy, but in the dispute with customers or in the inner dispute, it is definitely not easy. To repeat a universal truth: if something is easy to use, it was hard to design. Introduction too meta? Here come examples. With pictures! SMS, the mail of the 90es, was restricted to 160 characters. Why? Because postcards and telegrams rarely exceeded this length and saving memory was technically necessary . Its communication character is to be delivered immediately, but asynchronous. SMS got not only a part of everyday communication, it even applied socio-cultural effects like heavy usage of abbr. and emoticons =). 14 years later, a service called twitter appeared as “SMS of the internet” and became quite successful. Tweets are still restricted to 140 characters, even if discussed repeatedly . And again, this service had big impact to socio-culture: Hashtags became #famous and the @ outgrew e-mail. Now without technical reason, the character-restriction became one of the main factors of twitters success. User have to focus on their main message and reading times stay in the area of seconds. As well it is fast and asynchronous, but with a community factor aside. Some new services take the concept of “less” in advantage to make it a unique selling point. An example is the dating app once, where, compared to the illustrious tinder, only one profile is shown per day . They literally call their match “handselected” which should replace quantity with quality. Hence, reduction is part of the core concept of this product. This was reducing the content. Let’s proceed with geography. The App “Jodel”, an anonymous campus social chat only shows messages around your geobase . This constraint creates another kind of exclusivity and a particular privacy. Also nebenan.de, a German social network, detects the neighborhood coordinates and only lets user see people living nearby . Here the concept focuses more on privacy based on a non-global connectivity. The last app mentioned is snapchat, used daily by you if you belong to generation Z. This service is restricting “snaps” by time to several seconds . Afterwards they can be re-played once and then are “self-destroyed”. Not knowing if the unicorn filter or the time reduction are reasons, but snapchat became most used communication app for teenagers . In interfaces, this concept is well known. 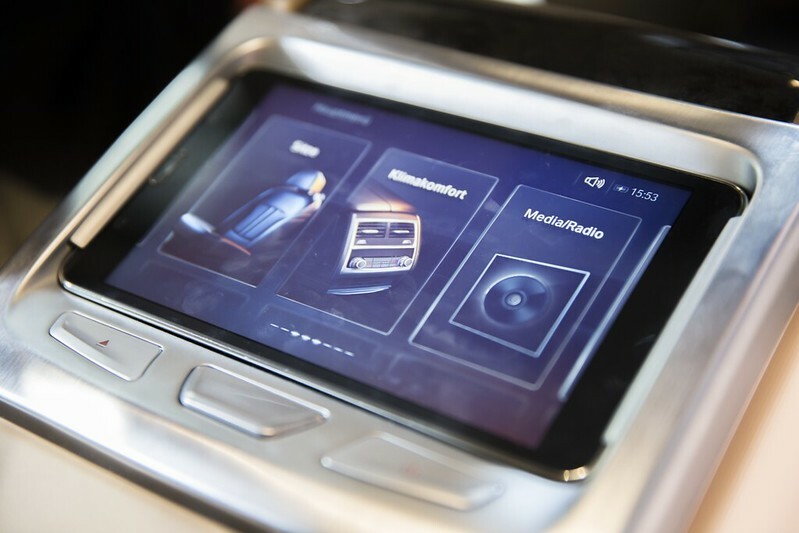 Products like the iPod, the WMF 1 [by designaffairs] or the Nest reduce their interface to one interaction object. A minimal interface architecture is used [see article to interface architecture]. There are several concepts pushing this principle of reducing to the max, e.g. You got here by reading? Nice. What we can learn from these examples is a focus on core features, on killer features is never wrong. Additionally, eliminating unnecessary ballast can hurt feelings but concurrently emerging your product. Think of the last beautiful person you only saw from the corner of your eye – didn’t this create more interest than a megapixel image? Try to do your design as mysterious and attractive as this. The representation of text message and webpages in movies can go across two different ways: on one side there is the need of not interrupting the scene and, on the other hand the need to show the text or the action, Considered as to important information That Must Be Displayed for understanding the movie. Based On These two needs we can see in the video different examples did can have a different perception of the content in the movie. Which are the best solution? Is it good to create unrealistic interface on the phones, thatthey just display the text? or it is better to create a solution where the text is integrated in the scene? In this video this topic is Described with Possible Solutions and examples. 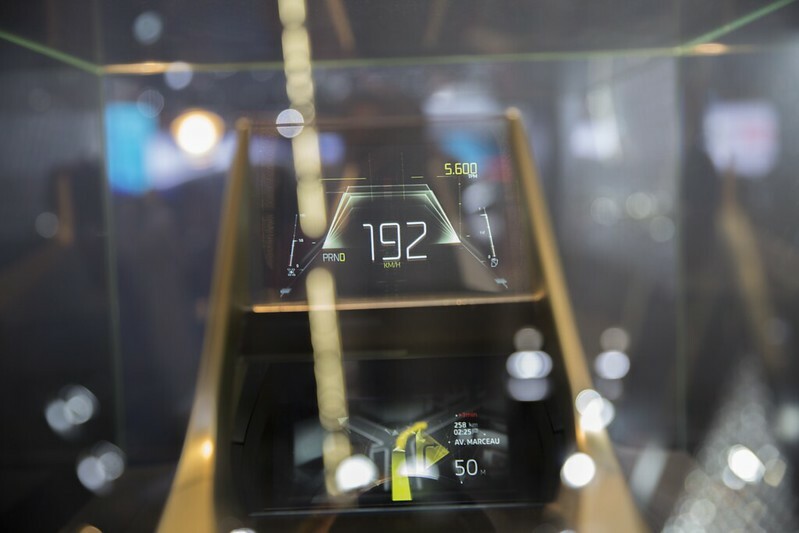 A great spirit of change, a vision brought to series-production readiness and presented in an excellent and unique design language – that has been the appearance of BMW at the IAA two years ago. In 2013, BMW mainly represented itself by the i3 and i8. 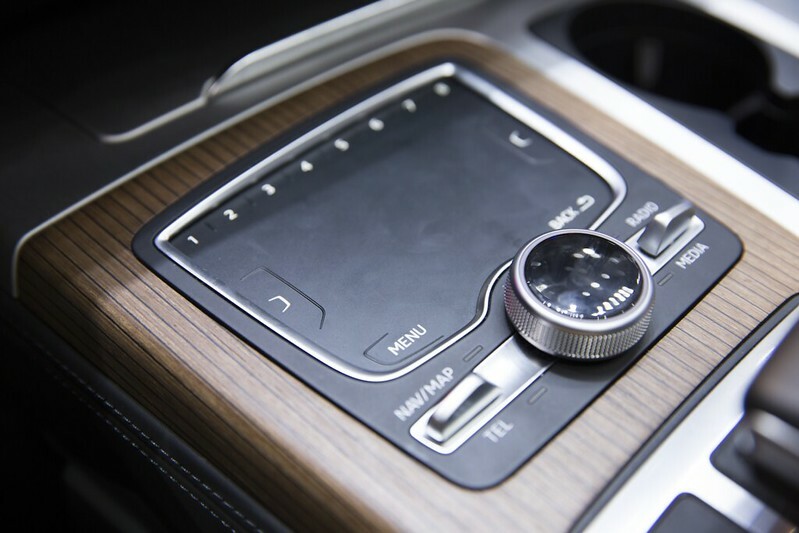 In 2015, kind of disillusionment has set: The Bavarian automotive company convinced with a solid performance based on a strong BMW7 ready to implement features into production that seem the be no more than a vision for others. 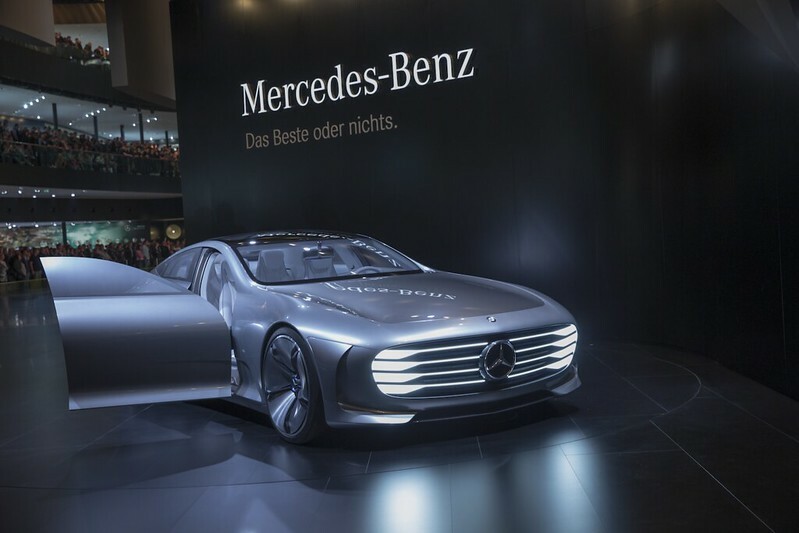 Only Mercedes appeared to be more than a well-sorted car dealer, performing an augmented reality show in a never-ending loop. 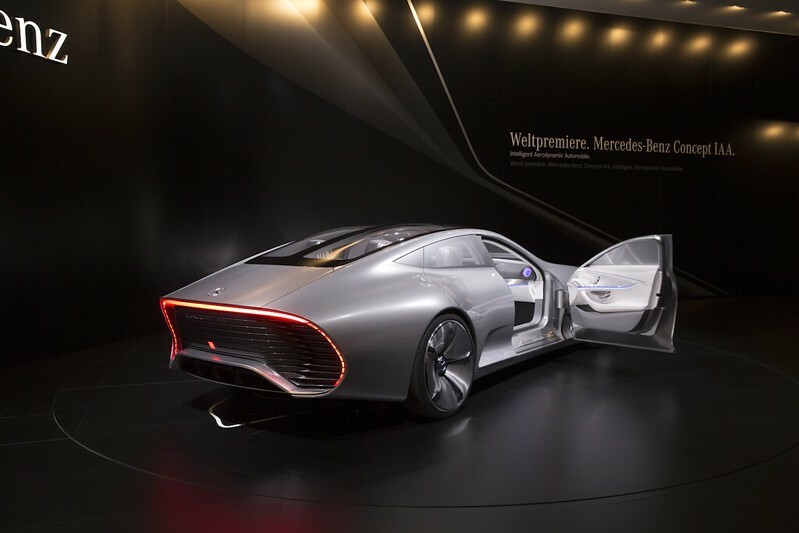 The Mercedes “Concept IAA” spread a spirit of the future with its transforming bodywork and rims. 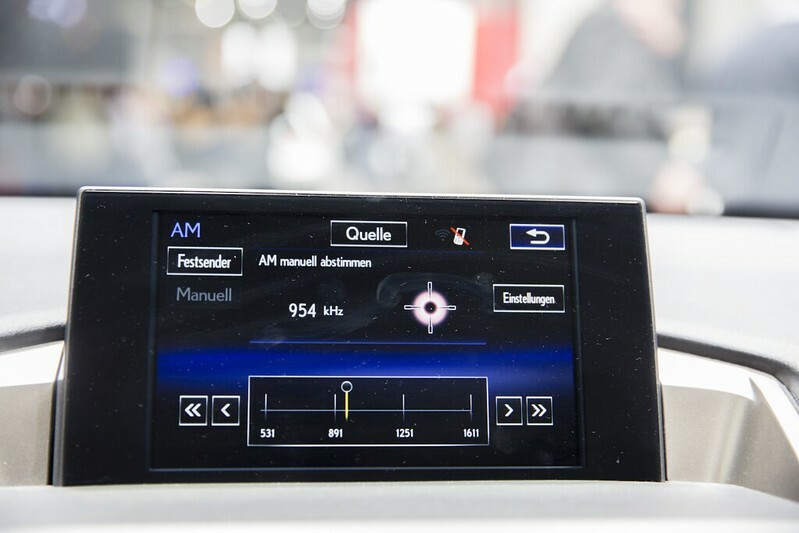 The times when drivers communicated only via klaxon, flash of the headlights or pointing the middle finger seem to be long gone. In the future, we will integrate our surroundings as communication medium through projections. 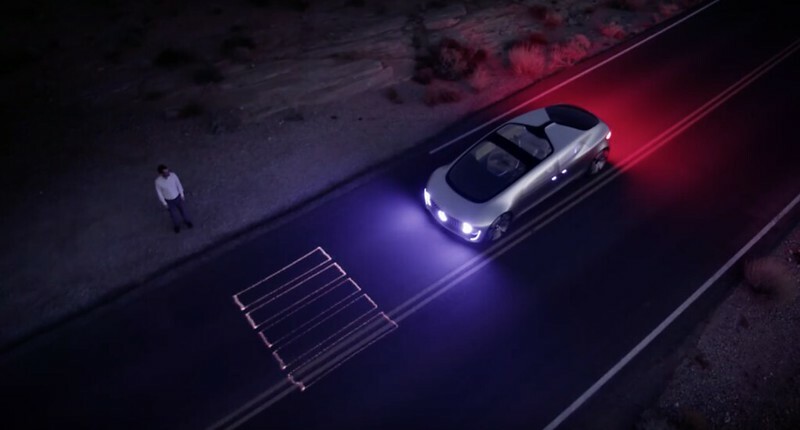 Mercedes already presented its autonomous driving car F015 in Las Vegas, which projects for example crosswalks for pedestrians. 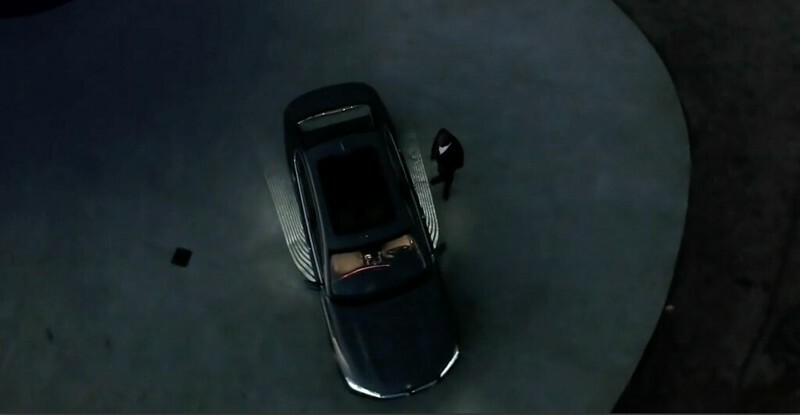 BMW is one step ahead with its 7 Series lighting the way during embarking and disembarking the car. 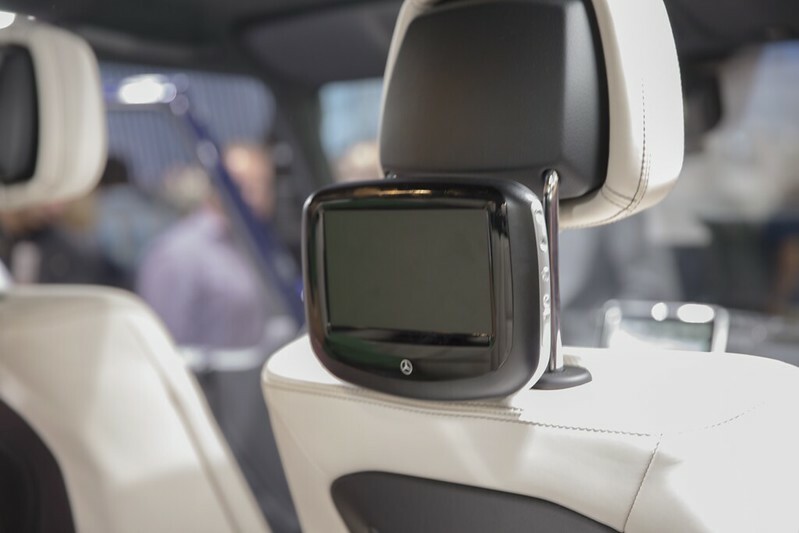 Car seats, in the best case comfortable, adjustable and including a massage functionality? Far wrong! 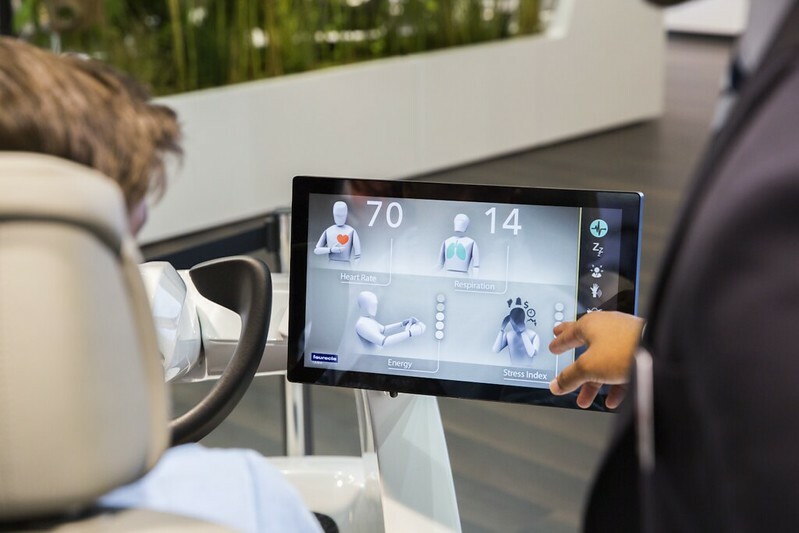 Sensors in „Faurecia’s“ car seats measure respiration, cardiac rhythm and biometric data of their passengers. 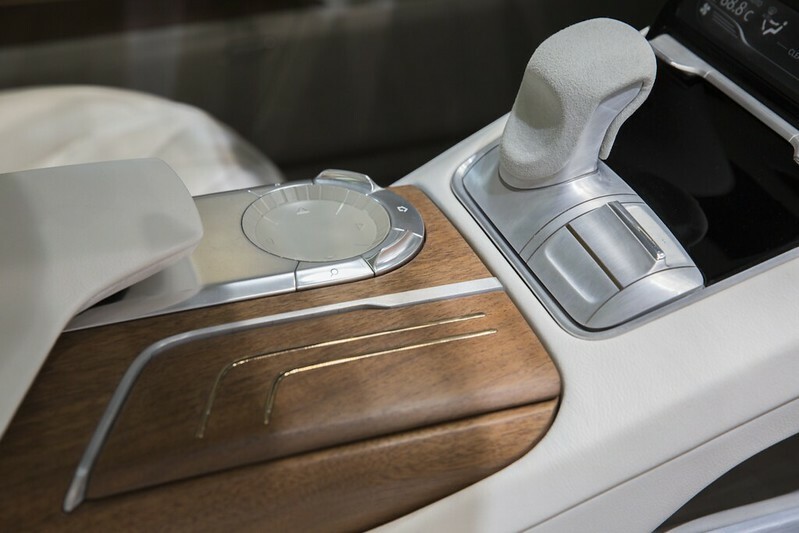 In case that the driver falls asleep, the system activates the lane assistant and awakens the driver with a massage. 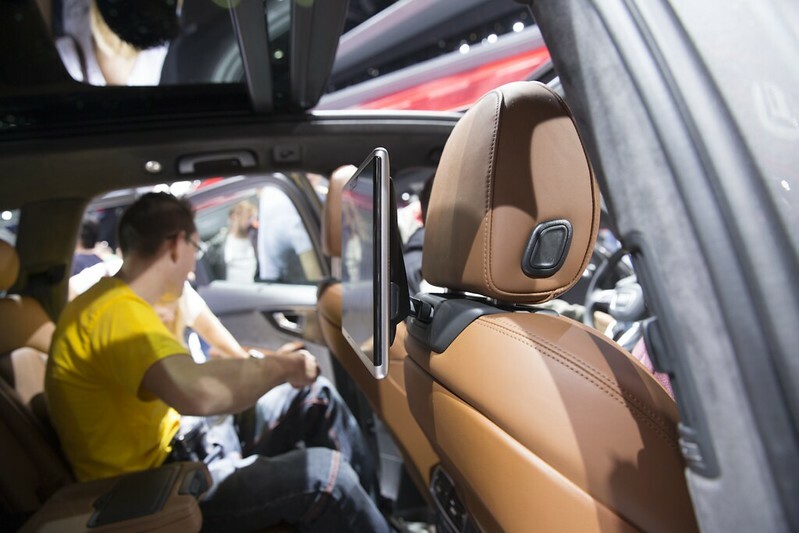 For accidents that occur nevertheless, the airbags adjust to the size of children, women or men. If the passenger’s heart stops beating, this information will be transferred directly to the rescue teams. 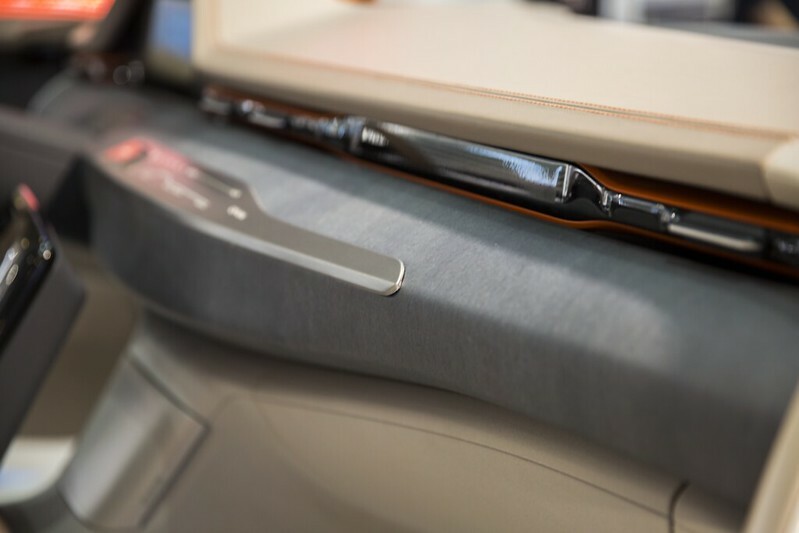 This car’s interior has been covered with a millimeter thin layer out of slate. Whether this is a reasonable option for weight reasons needs to be discussed. 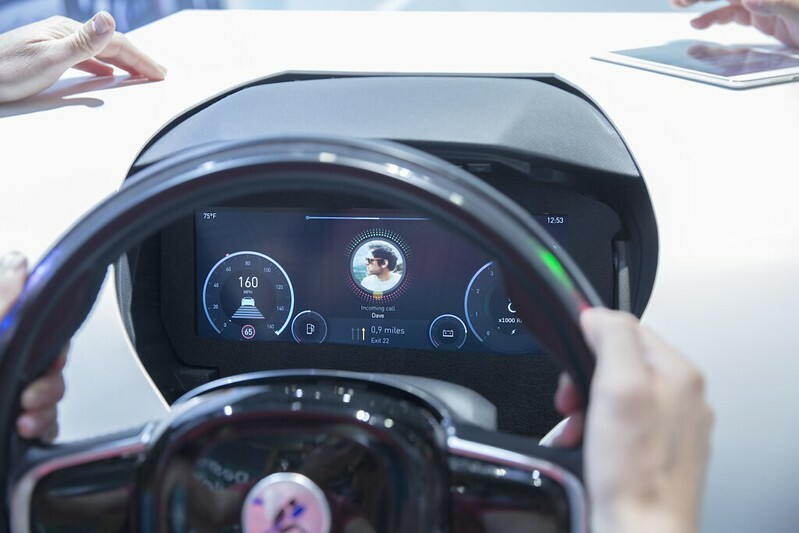 But for many fields of application this could become a really interesting solution: The layer is thin enough to let light and LED through, which means it could be used for displaying interfaces. Interaction via gesture control is not a new phenomenon. For several years now, you can easily build prototypes using a Kinect. 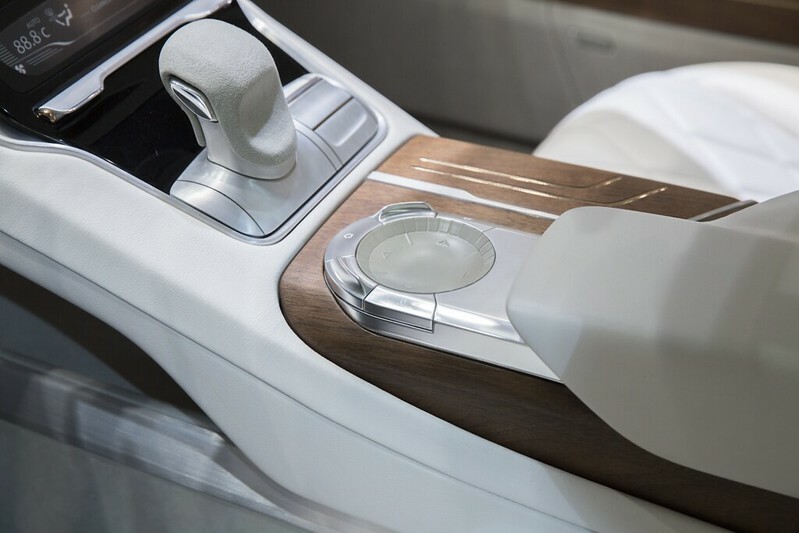 BMW is one step ahead with its 7 Series: Many features that for the competitors remained in concept phase were realized and produced in series. 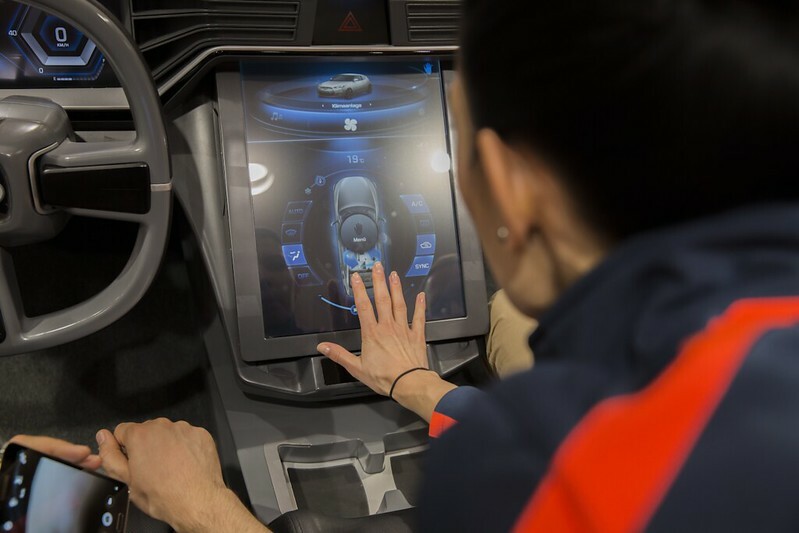 Starting with the touch display key up to gesture control. 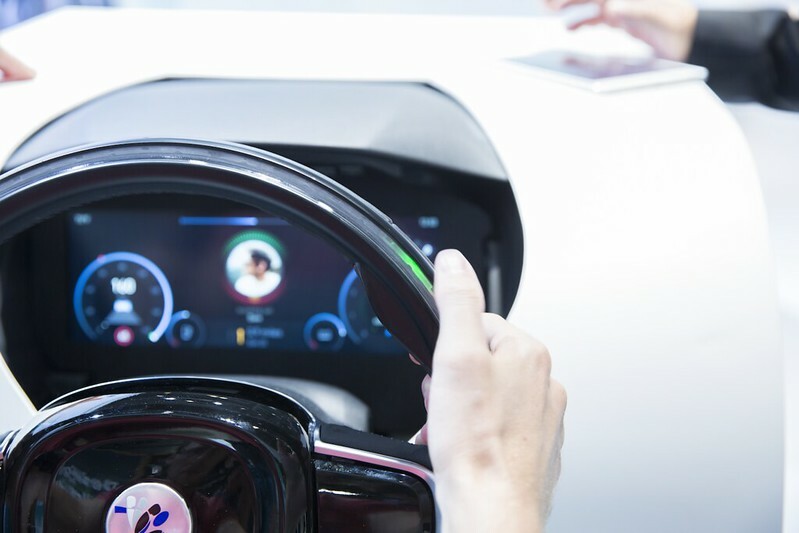 But more than any other way of interaction, the gesture control has to be learned by the drivers: Which gesture means what, where is it used and functional? That’s not easy and not yet intuitive. Therefore, today gesture control only makes sense in some very specific use cases. 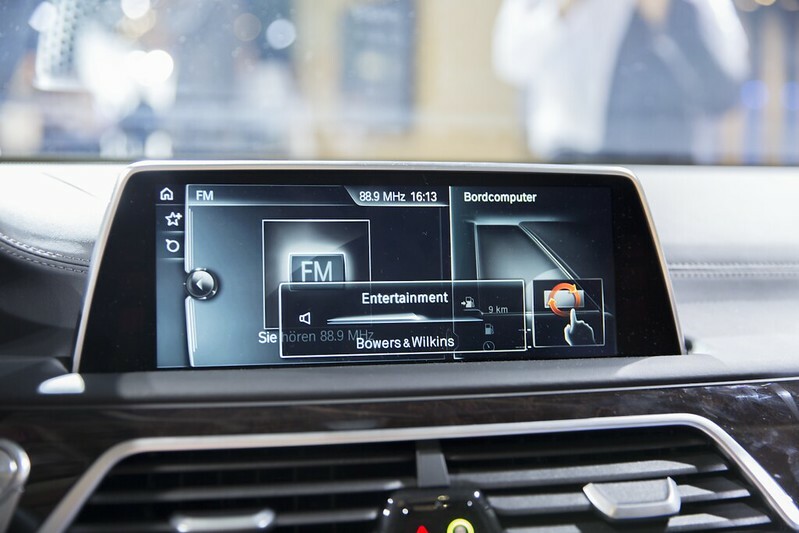 For example, BMW uses gesture control to change the volume of the radio. 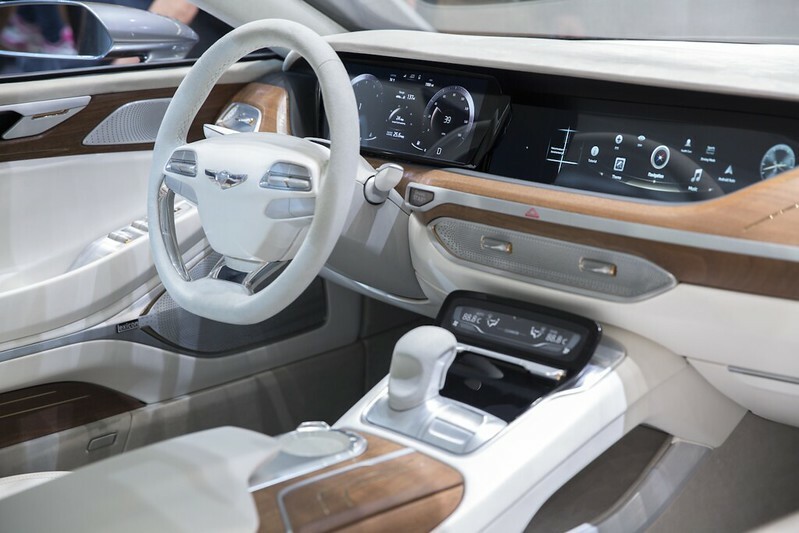 Of course, it’s working as well via buttons at the steering wheel, rotary controls or voice control, but gesture control now offers a forth option. 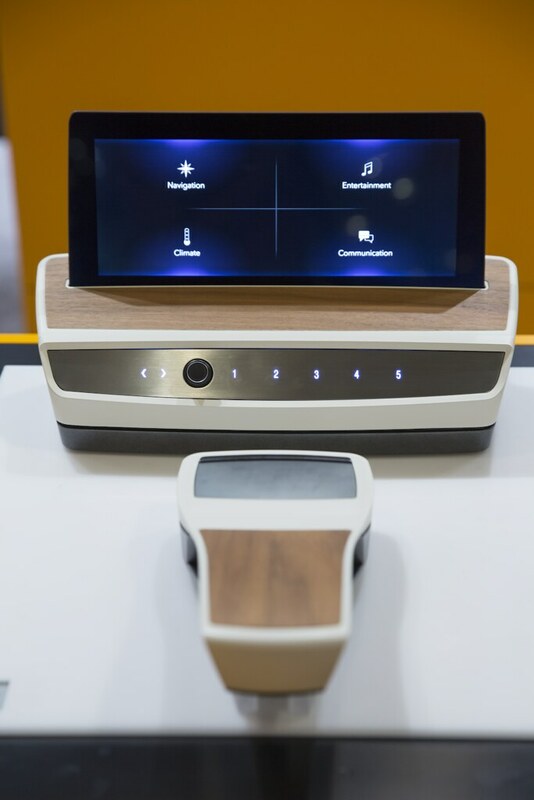 Rotary controls are used everywhere, gesture control isn’t working in any use case, so why not implementing a touchpad? 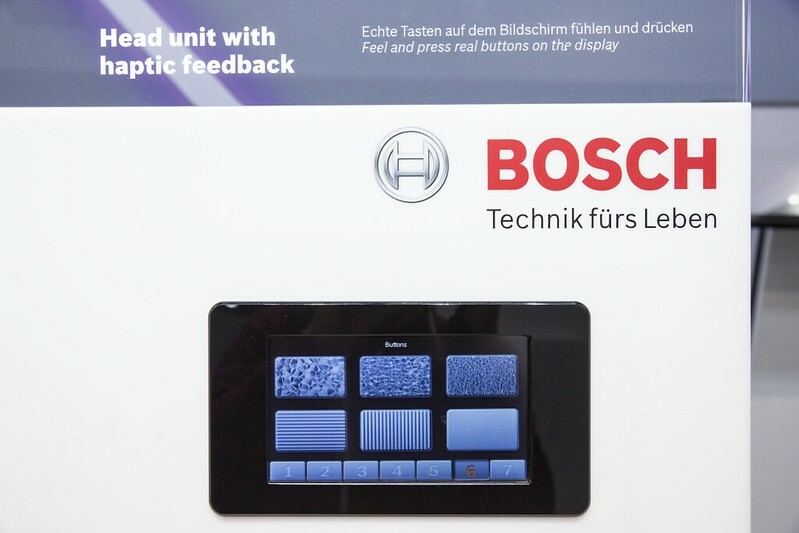 The touchpad is becoming an important and independent input element. 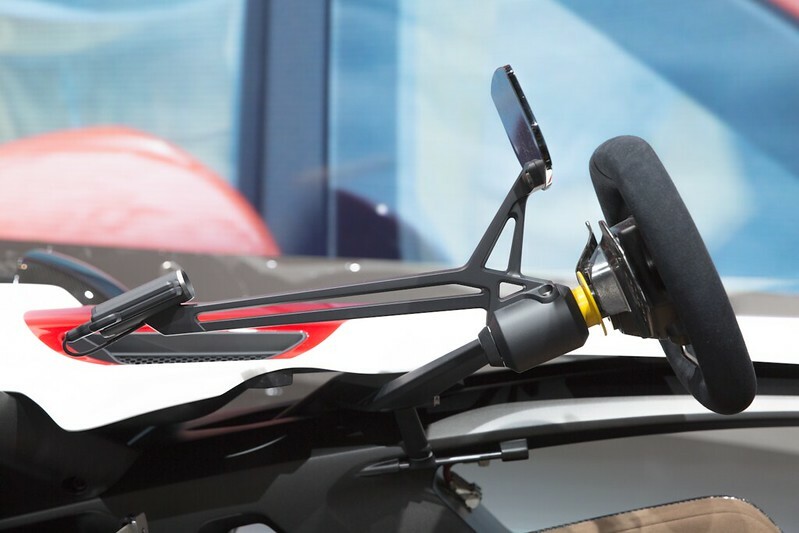 It is equipped with raising shapes or Force Feedback to offer better orientation. 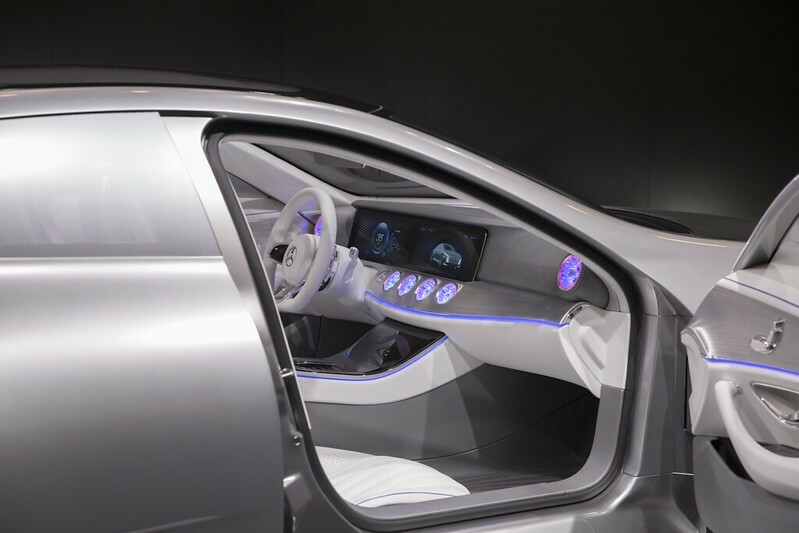 Both trends have been applied in the concept for Hyundai Vision G Coupé in an amazing way. 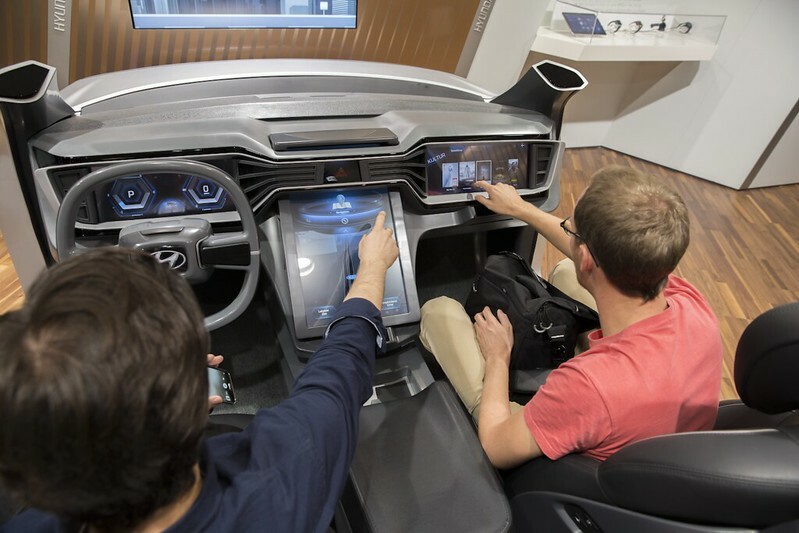 Hyundai itself characterizes its device as follows: “The ‘Remote Wheel’ is an ergonomically designed semi-sphere haptic touchpad installed in the center console. 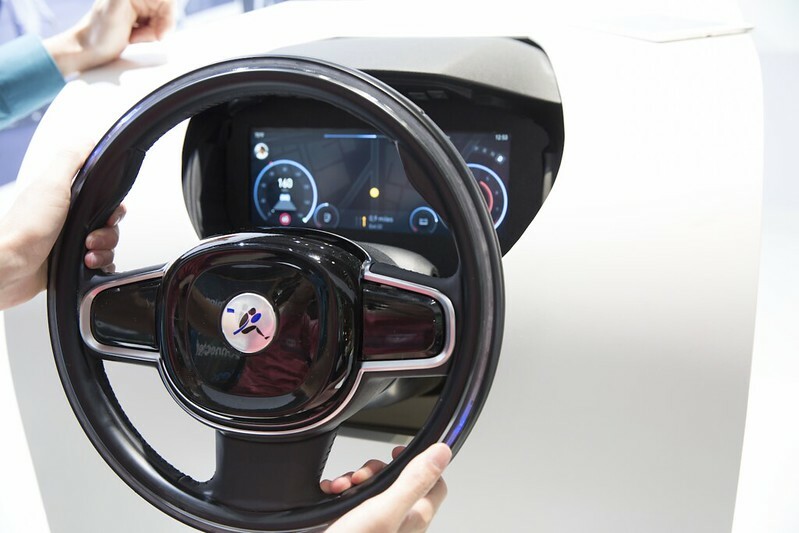 It offers intuitive touch and gesture interaction and responds to a simple wave of the hand, minimizing driver distraction”. 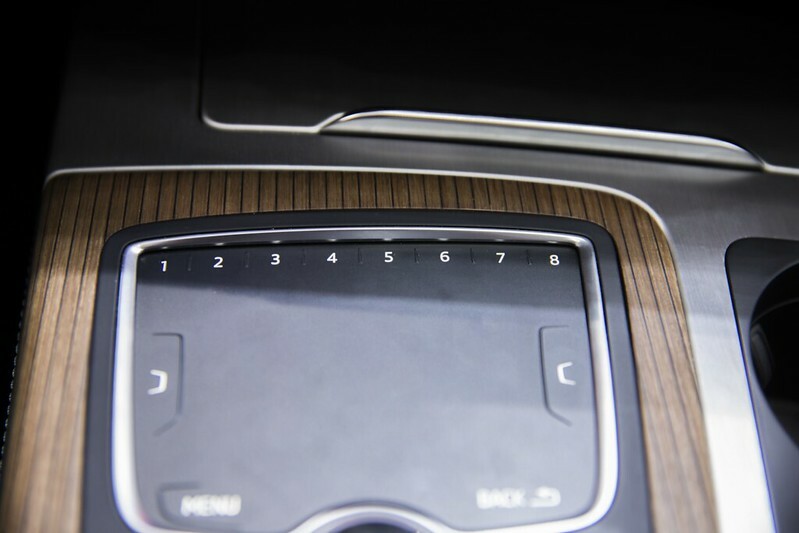 Audi presented their touchpads without Force Feedback but using even more rotary controls. At first sight, it’s not clear which input device should be used for which function. 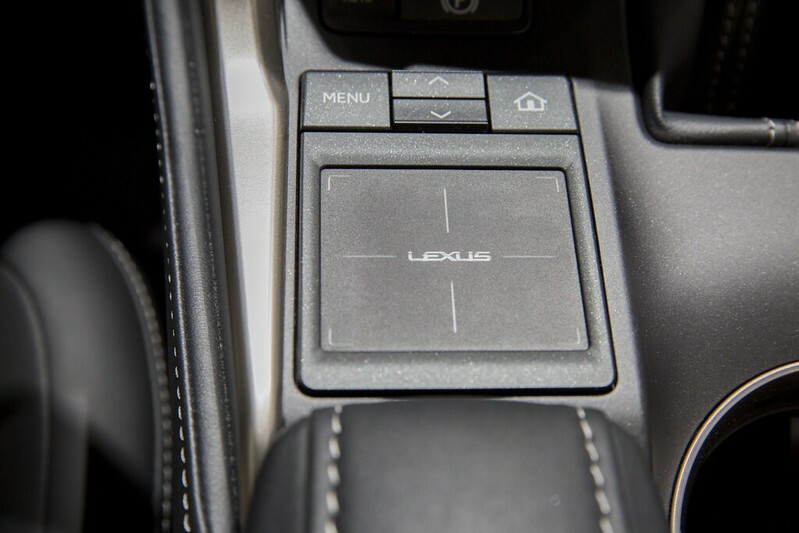 The most interesting and drastic implementation of a touchpad has been produced in series by Lexus: It includes Force Feedback, is functioning perfectly for most applications but ends in disaster when it has to be used via cursor. 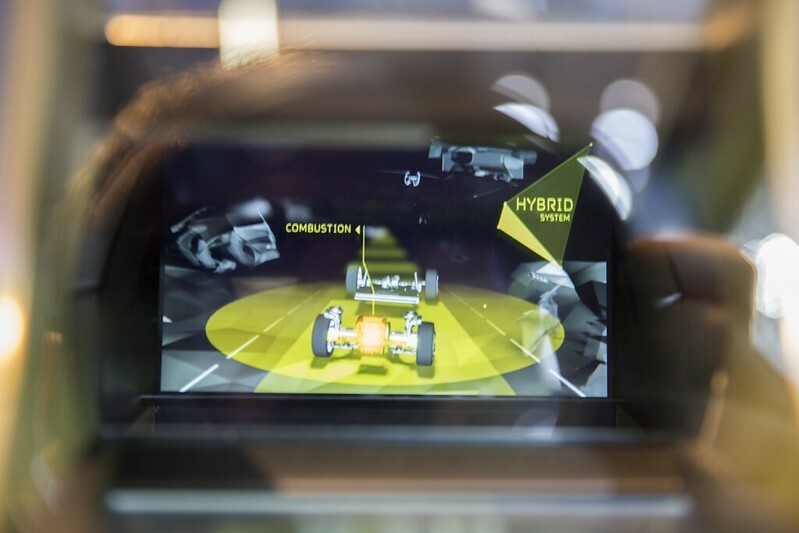 You will see Force Feedback in every third car presented at the IAA. But none is giving you the feedback of a keystroke as it does the Apple MacBook. 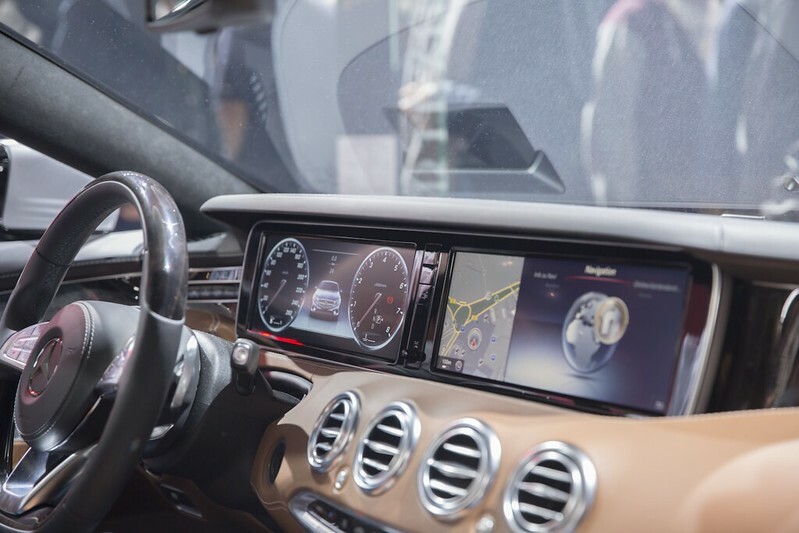 The instrument cluster: less analogue, bigger and with a sense of future. 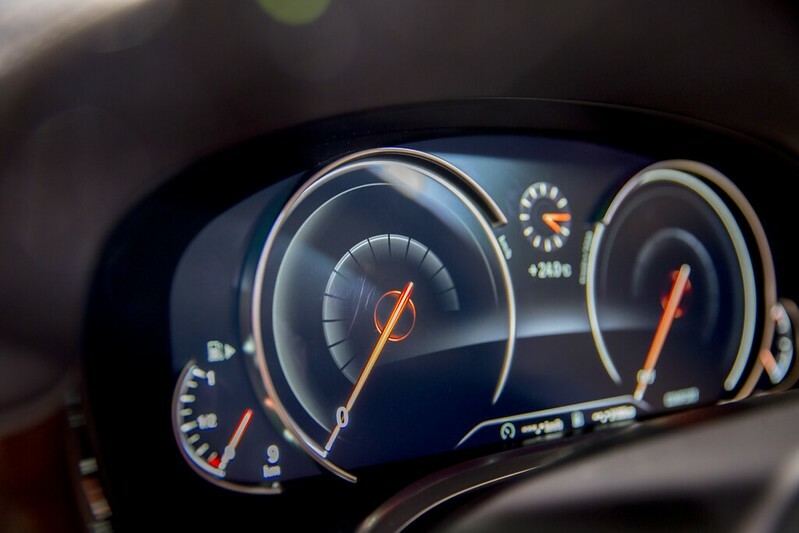 The most interesting instrument cluster has been presented by DS Automobiles consisting in a head-up-display and two sequential screens. The screen in the front row is transparent and complements the content of the second one. 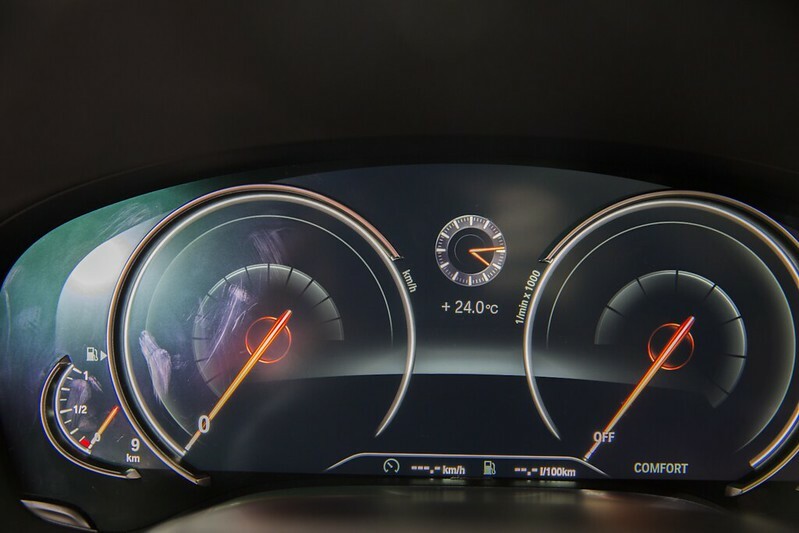 Continental showed with this instrument cluster that LEDs can form a perfect unity with an OLED display. 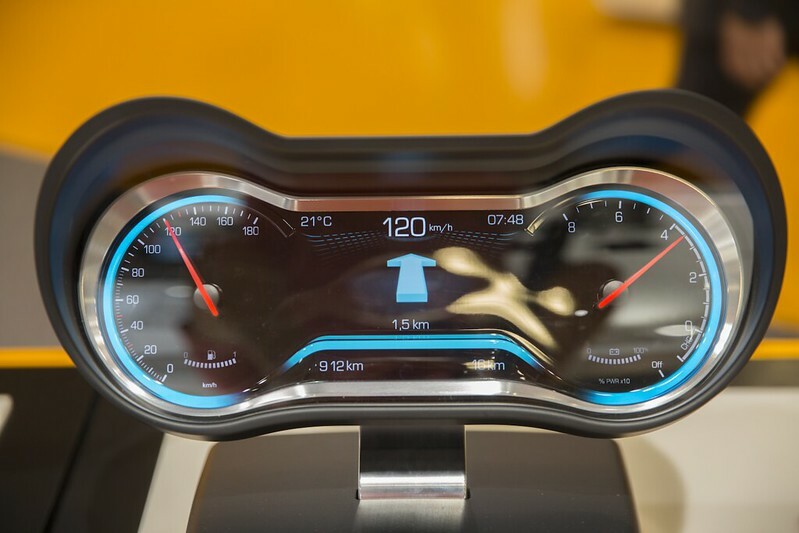 BMW covers some parts of its instrument cluster with rounded tape to conceal unattractive screens. Apart from that you get the impression: the more screen, the better. 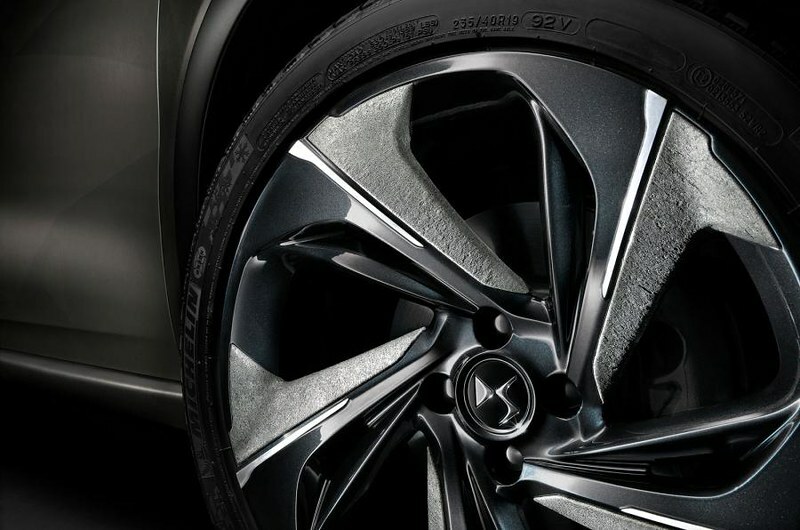 Nissan can’t keep up concerning innovative materials, but they found a way to use creativity to compensate these disadvantages. 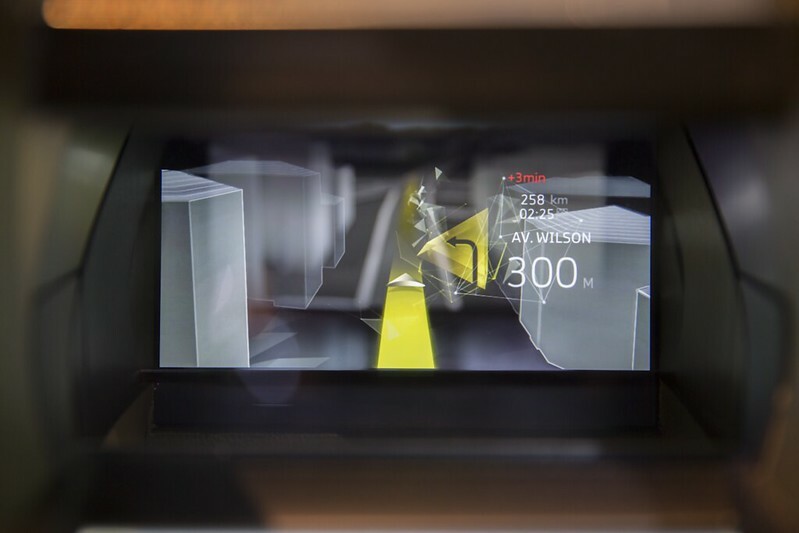 Until now, most of the implemented screens gave the impression of a tube television. Why not using thin Android tablets? 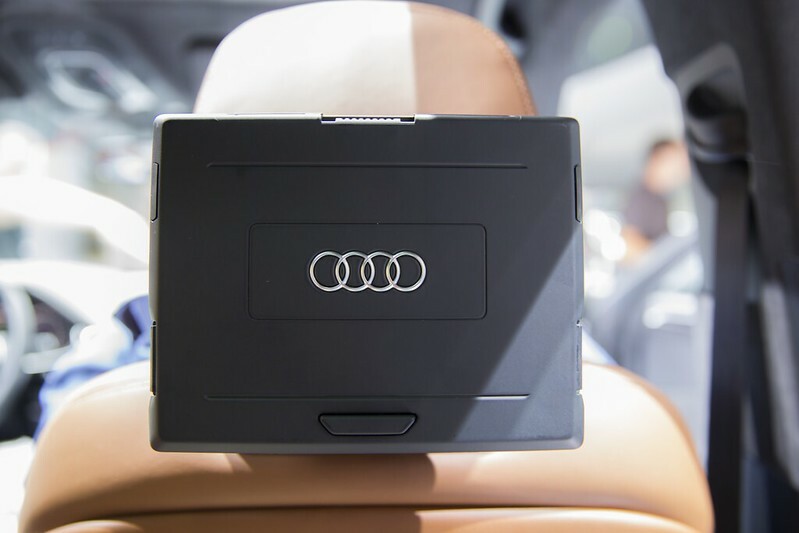 In this field, Audi scores with their rear seat Android tablets. 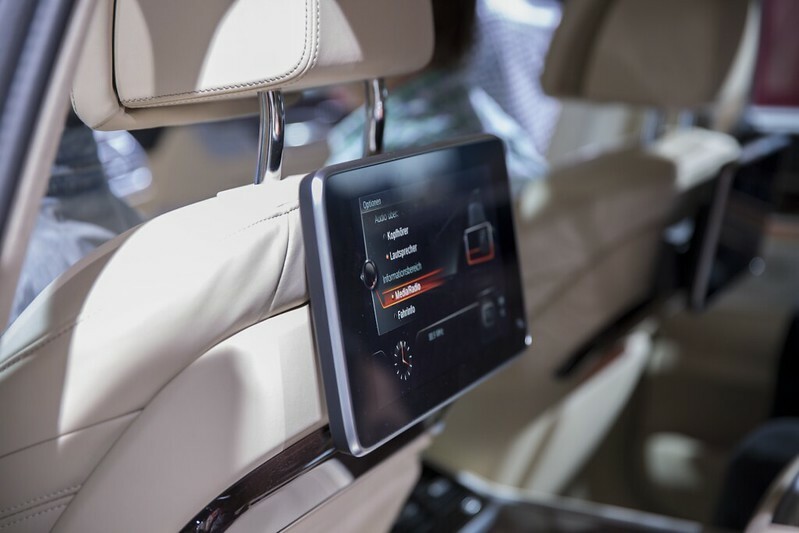 And again the BMW 7 Series scores with its rear seat entertainment. 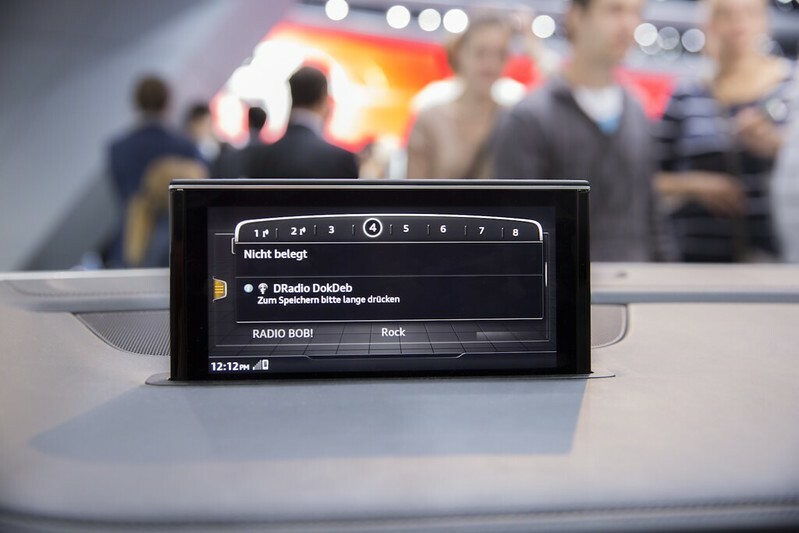 Even though the built-in tablet is smaller and fixed in between the two back seats, it is working as well with Android. However, the rear seat tablets still have adequate room for improvement. 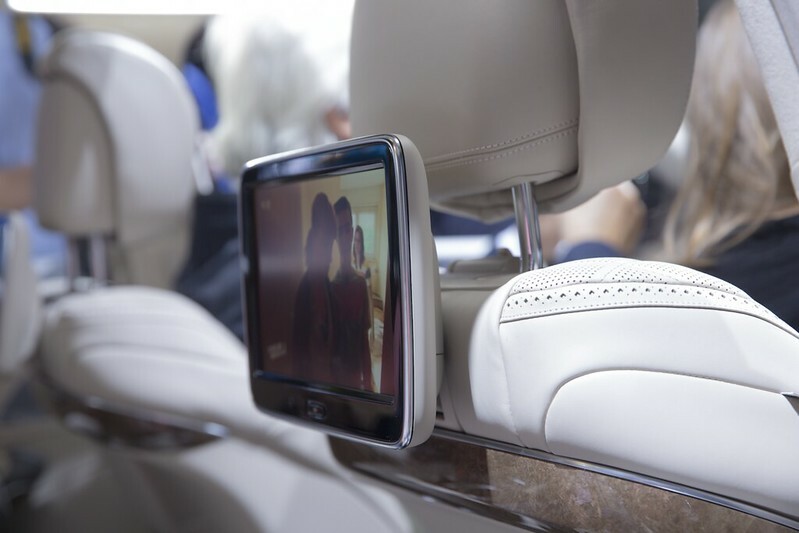 Most of the other rear seat entertainment screens seem to have fallen out of time. 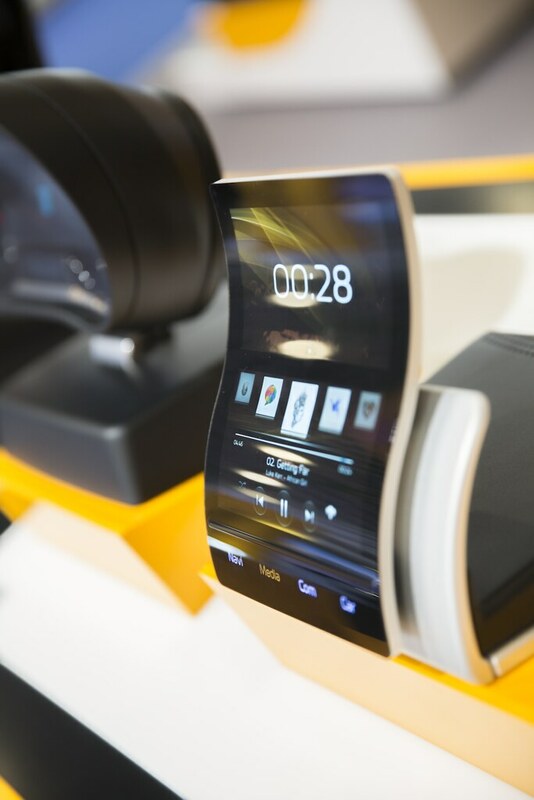 Neonode impressed with an enlargement of the touchable area of smartphones. 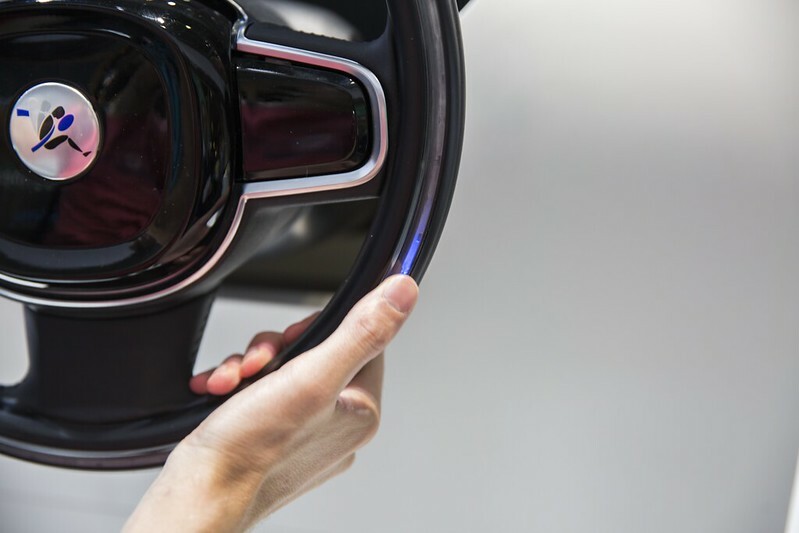 Another great idea is to place buttons on the steering wheel close to the common hand positioning. 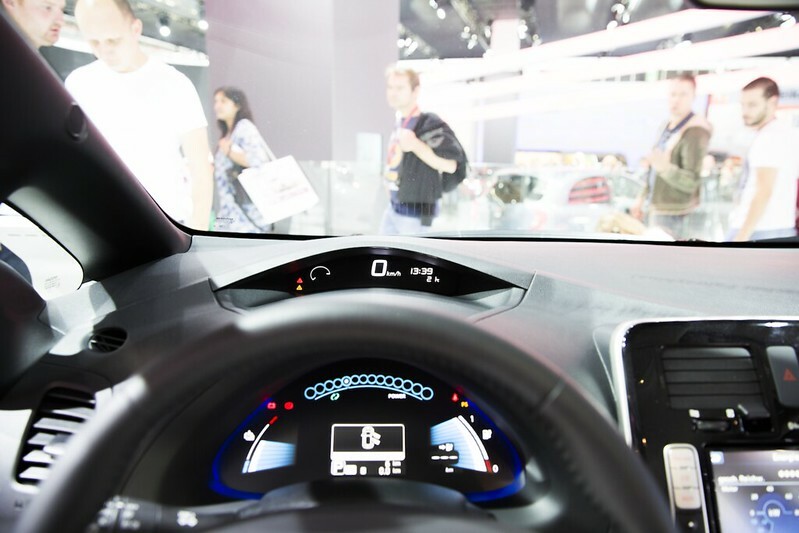 In the future, street lamps won’t just light the roads, but also offer electricity and monitor parking areas. 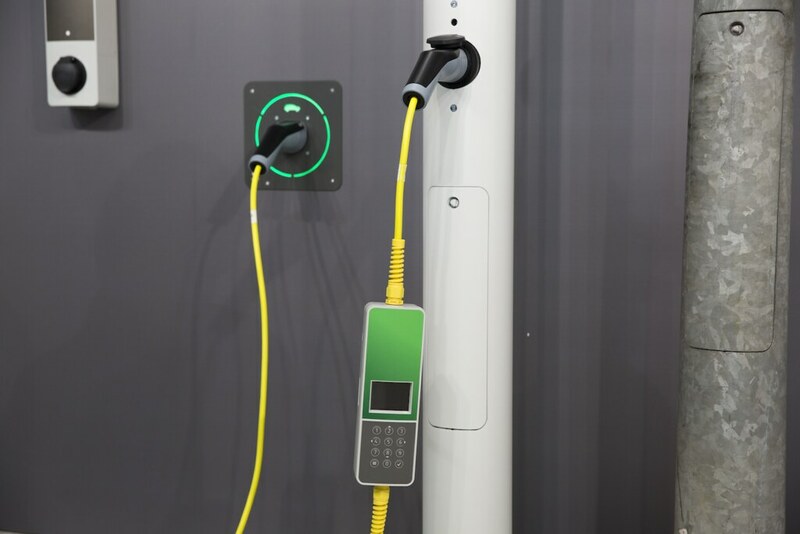 The future charging cable will bill electricity on its own, no matter where you charge your e-car. 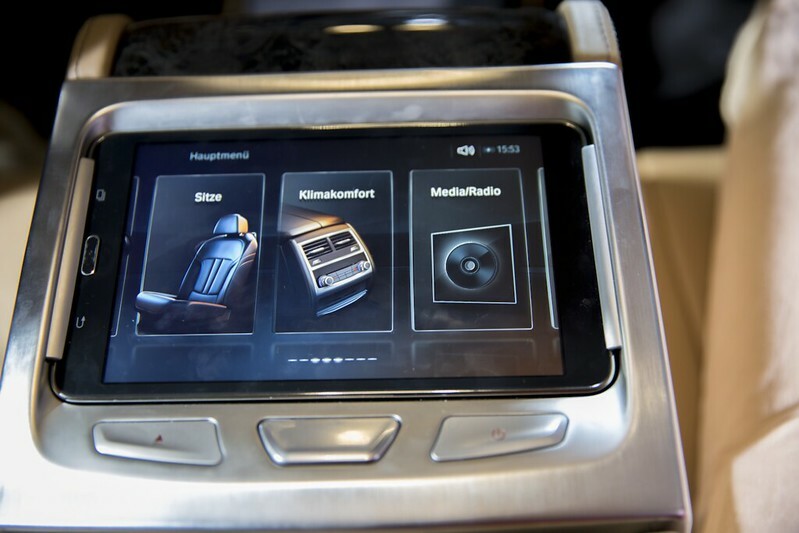 Besides from that, Continental presented curved displays and Force Touch screens. 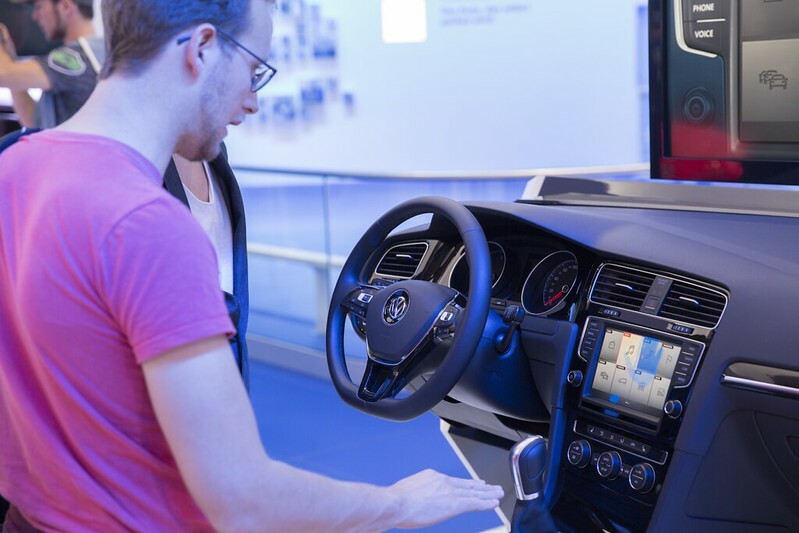 In the past years, it was worth to visit the IAA only for its interactive installations. Unfortunately, it seems like those kind of installations are running out of fashion. 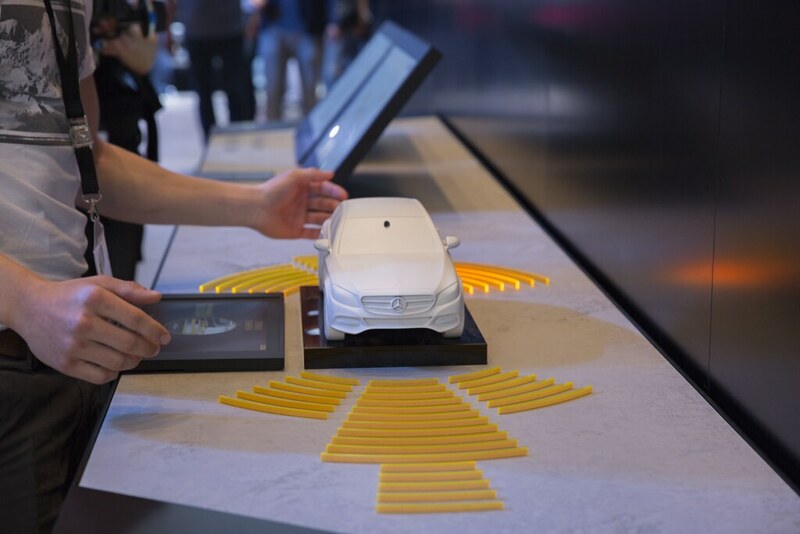 Mercedes was one of the only ones explaining their technology using interactive installations. 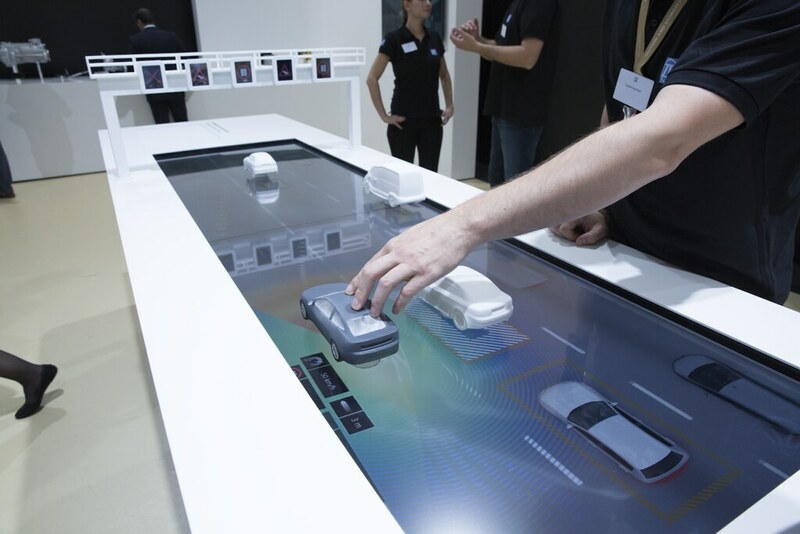 Even if those kind of installations hasn’t been quite innovative, it helped ZF to explain the seven steps of autonomous driving vividly. In Graz we took part in the WorldUsabilityCongress (7th/8th of October ’15) with 250 participants, a lots of presentations and several company stands. Both presentations were broadcasted via livestream to the internet. Also, there were a lot of interesting presentations by SAP, MIT, W Motors, Porsche, Microsoft, Caterpillar, Telekom and many many others. Furthermore, Graz is a very nice little Austrian city and the diner at the castle restaurant was astonishing. designaffairs looks forward to come back next year! „as·phyx·i·a“ is an experimental film showing new ways to combine technologies – with really stunning results! Projection mapping part 2: „Pixel“ dance show by french artists Adrian M & Claire B featuring 11 dancers interacting with … PIXELS!